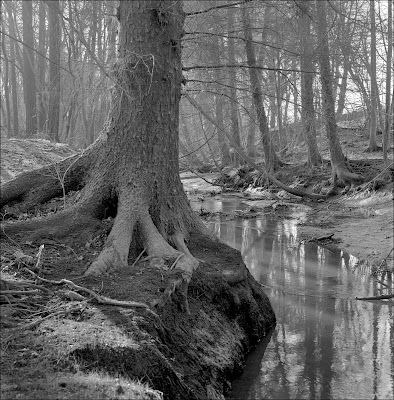 These are some shots from the first rolls of HP5 Plus I exposed in The Carse a month or so ago. I made the mistake of getting a couple of James Ravilious books and I was blown away by the tonal qualities of his images and I'm on a quest, as many before me have been, to see if I can achieve something similar. The mistake was realising just how high he set the bar for this kind of work. 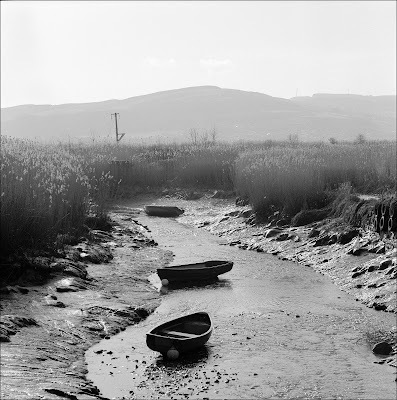 James used HP5 for his later photographs, rating it at 200 ISO and using a compensating developer. I'm not sure which brew it was but I wouldn't be surprised to find it was Perceptol so I've been re-exploring the two Ilford products that I last used together many years ago. I'd say the"experiment" has been a partial success but not a complete one. Like James, I shot at 200 ISO. The Perceptol was at the 1+2 dilution since I felt 1+3 would provide too much compensation and maybe reduce overall contrast too much. The results? Not bad but I think 1+2 has compressed the mid tones a little - even though Barry Thornton, in his book Elements, said it wouldn't. The negatives are a little soft in contrast and will probably need grade three or maybe a bit harder when it comes to printing. Capturing the extremities of the tonal range is easy enough using Perceptol like this but the negative scans here do look a little flat to my eyes, even after a bit of work in Photoshop. The negatives, in terms of their contrast range, are a little like those I was getting from Barry's two-bath developer. Both developers would be ideal for close-ups of sun flares but up here in sunny Scotland? Maybe that's asking too much of them and I might well need less of the compensation and more robustness. Changing to a 1+1 dilution of Perceptol might improve the contrast but the price per film developed then works out at about £1.25 (a £5 1 Litre pack does four 120 rolls) which is getting on the expensive side. In fact 1+1 works out the same cost as using the stock solution which can also manage four films per litre if reused. What's the answer? Well, fortunately, with 120 film grain and sharpness aren't too crucial since there should be enough of both. It's all about tonality then and maybe I need to look at stock ID11 which produced some nice negatives when I used it with Tmax 100. With the duller weather up here compared to James's Dover haunt it's possible that HP5/ID11 stock would produce similar results to HP5 and a compensating developer. There is the possibility that printing these SL66E Perceptol negs on grade 4, say, will open up the mid tones and produce just the results I'm looking for. I'll know soon enough one way or the other. One of the other issues I had was the appearance on a few of the negs of pin holes in the emulsion - spots that would come out black on a print. I had a look on the internet for possible explanations but couldn't find anything conclusive so I took Phil Roger's advice and emailed Ilford. It will be interesting to hear what they think might be behind the holes. The set-up was Perceptol at 1+2, 13.5 mins at 24C, a plain water stop bath and a soaking in Champion fixer. I can't remember seeing pin holes on any of my negatives before but it is possible there have been one or two that I didn't notice. The third and, thankfully, final issue was the appearance of some bubble-like marks along the edges of one film. There was plenty of developer in the tank - 1100mls when I needed 1000mls to cover the film. This isn't the first time I've had this problem. It hasn't actually ruined any negs completely but I do have to crop a little off which I don't like doing. This is almost certainly caused by frothy bubbles sticking to the plastic Paterson reel for some reason. One suggestion I read was counter-intuitive but seems to work: the addition of a drop of wetting agent to the developer. Logically, you'd think this would just cause more bubbles but if just, say, 0.2ml is added to a litre of developer then it seems that there's just enough to reduce the surface tension and allow the bubbles to pop off the reel. No doubt if I decided to agitate like Tom Cruise in Cocktail then I'd have an even bigger problem than before I started but gentle to normal agitation seems to be okay. Aside from these three problems, the negatives were fine! I think you'll become quite familiar with Port Allen, the first photograph in this post. The place has a lovely atmosphere to it. It doesn't look much now but the local landowner, Mr Allen, had high hopes for it in the 19th century. He saw it as a potential rival to Newburgh on the opposite bank of the Tay but the water channel off "our" bank wasn't deep enough and Port Allen slowly withered. There are the remains of a harbour wall of sorts but not a lot else. Still, it's a charming wee spot and a bit of a sun trap and I'll be checking it out in all sorts of conditions. This photograph of Aithmuir Farm has a nice atmosphere to it but that's partly down to the flare that the 40mm Distagon suffers from to some extent. This was taken directly into quite a strong light which the Perceptol has handled very well. However, take a look at the top of the tree in the centre and the bottom of it. The top isn't dark because I burned in the sky: it's just that the bottom has flared a little and lowered the contrast. The Pow of Errol flows into the Tay at Port Allen after winding its way slowly through the Carse countryside, passing through a gently sloping valley which is wooded on both sides. The spot where I took this pic is only a few hundred yards from the Port Allen shot and it's another place I'll be revisiting. It'll look different throughout the seasons and it'll be interesting finding out when it's looking it's best. My vote, subject to revision, is for early Spring when small, light green leaves will soften the winter look pictured above but still let some light through. This shot was taken on the same walk as Port Allen and the Pow of Errol and is about a quarter of a mile from the port. The Tay forms a small lagoon at this point and on this particular day in March the water had a skin of ice on it whilst the sun was doing its best to burn the skin on my overly-sensitive and unprotected (by hair) head. It really was a beautiful day. So lovely, in fact, that I took a couple of pics on my iPhone and emailed them to Phil Rogers at work just to make him feel jealous. Sorry, Phil. The story with this one was that I'd set the tripod up with the SL66E on it and the 80mm Planar on the front. After the usual faffing about I came to the conclusion that what I really needed was the 40mm Distagon to give some emphasis to the foreground and capture the nice clouds. Off came the Planar and just as I dived into the bag to get the Distagon I heard a furious flapping and could see a couple of hundred yards away that a few geese were attempting one of their "running on the water" take-offs - and heading straight across my photo. I grabbed the Distagon, bolted it in place and just had time to quickly focus before the birds flew into the frame and were captured for posterity. Another few seconds and they were gone. Perceptol excelled itself for this shot capturing every tone in the sky and clouds even though the contrast range was great. Had I been using digital then it would have been a piece of cake to blast away with the do-everything-zoom on the D700 and Photoshop the geese in back home if they didn't appear in the proper position in the frame but that's just one of the reasons why digital is crap and film is the bee's knees! Really lovely photos - to me they make a statement about the place. I am not sure you need more contrast as they seem spot on to me, but that is for you to determine (as to how much work it is to get a decent print). I had a problem with pinholes in the past with medium format, generally Kodak Tmax400. I eliminated it by eliminating the acid stop bath and just using a water stop, which you say that you already do. Are all the temperatures the same? I have cold water at 50-55 degrees(F) during the colder months in the Northeastern US and make certain to get all temps up to the same as my developing temp (68 or 70 degrees F). Let us know what Ilford says about this. These are wonderful Bruce - you're capturing an air and a feel, and dare I risk making you blush, a Ravilous sort of look. Keep them coming - the Carse stuff is already turning into a nice little body of photographs. I actually think the HP5/Perceptol combo is working well. Hello Bruce, you probably already know that HP5+ is a low contrast film and diluting developer will also lower contrast. Like the photograph of Port Allen it captures the flat light of the northern hemisphere very well. Do you use the tilt function on your Sl66? If so what is your focusing routine for keeping the foreground and far distance in focus? Very Fine work. Lovely tonal qualities. 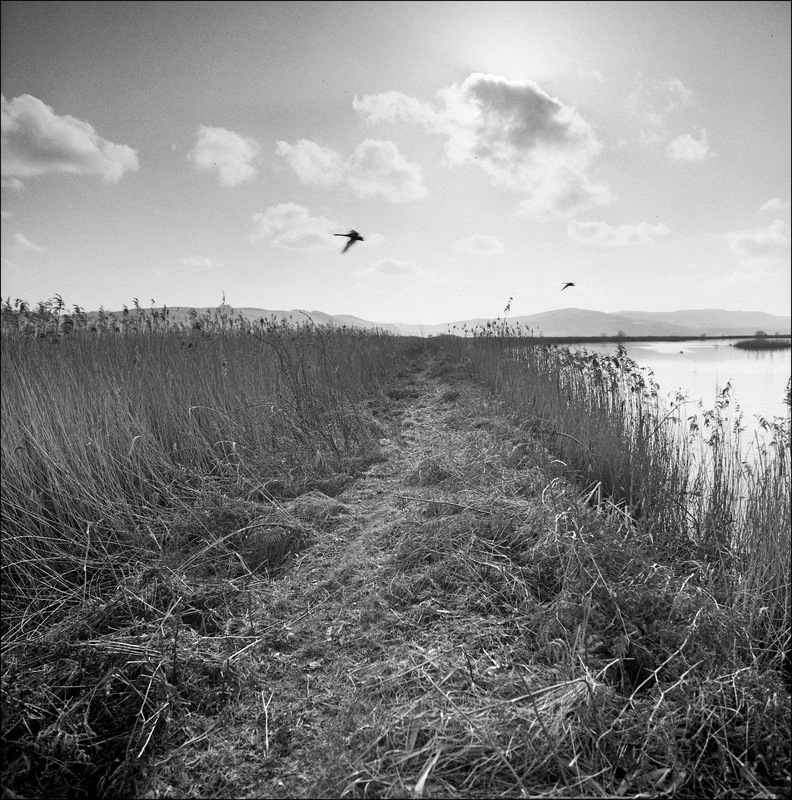 Port Allen and the reed bed are my favourites simply because you’ve captured the light so well with this film dev combination. If you have more backs for the SL66e you could use an alternative film dev combo for different conditions? You may be missing one element from Ravilious’ technique, Bruce. He favored older, even uncoated, lenses to give him the look he sought. If it was only one element that was missing I'd be a happy man, Dave. You're right about the old lenses but that would be a step too far for me. I'd have to build a Ravilious lenshood to keep down flare for a start. I'm going to write a post about Ravilious's technique as there's a lot of interest in him but not everyone has the books explaining how he went about his photography. I’m a very, very big admirer of Ravilious, not so much because of his photographic and darkroom skills, which I do admire, but because I think he lived the photographic life as it ought to be lived. I have most of the books by or about him, including the recent biography by his wife. I also jusr got the Michael Morpurgo book, but haven’t had a chance to go through it. I think his documentation of his corner of Devon will continue to gain the recognition and approval in the art and photography worlds that it deserves. I particularly like the Pow or Errol ....trees I find can be a difficult subject where the eye can be confused by the branches darting in every direction. Here you have a great balance to the photo which I think is due to the dominance of the trunk and the water combined to leave a less confused area. 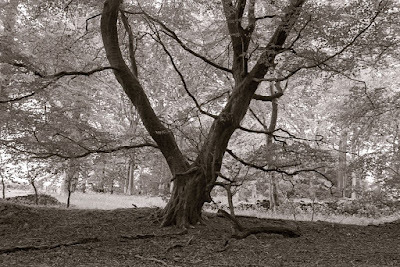 Last weekend I was at the V&A and caught the end of the ‘into the woods’exhibition there, where I found some surprises in the way past masters and today’s artists using film have portrayed trees in their work. From Ansels Aspins, so sharp, crisp and contrasty to Bae Bien U’s soft diffused light. Look him up... South Korean photographer. Ravilious, it seems spent a great deal of his life wrestling with his prints in the darkroom in seeking his own perfection....I have just finished reading ‘A life’ by his wife Robin...a simple life really for both of them where money was always in short supply but a life rich in achievement which I think is only recently being recognised. ID 11 .....got some on the go myself at the moment,,,,what would be your agitation for this? Thanks, Martyn. Agitation is fairly standard at an initial 30s and 10s every minute. Thanks Bruce, a nice post. I think JR went to big lengths to get a certain look. I am looking at his photo 'View of Pitt Farm 1996 from 'The Recent Past' as I write this. Quite a bit of flare, but somehow it seems to add rather than subtract. I use a 1956 red Elmar 5cm, but it is coated, as I don't think I have the patience to make my own lens hoods. I would love to know what JR's brew was. Robin does not say in her book. I guess by using yellow filters JR achieved greater tonal separation of the greens. 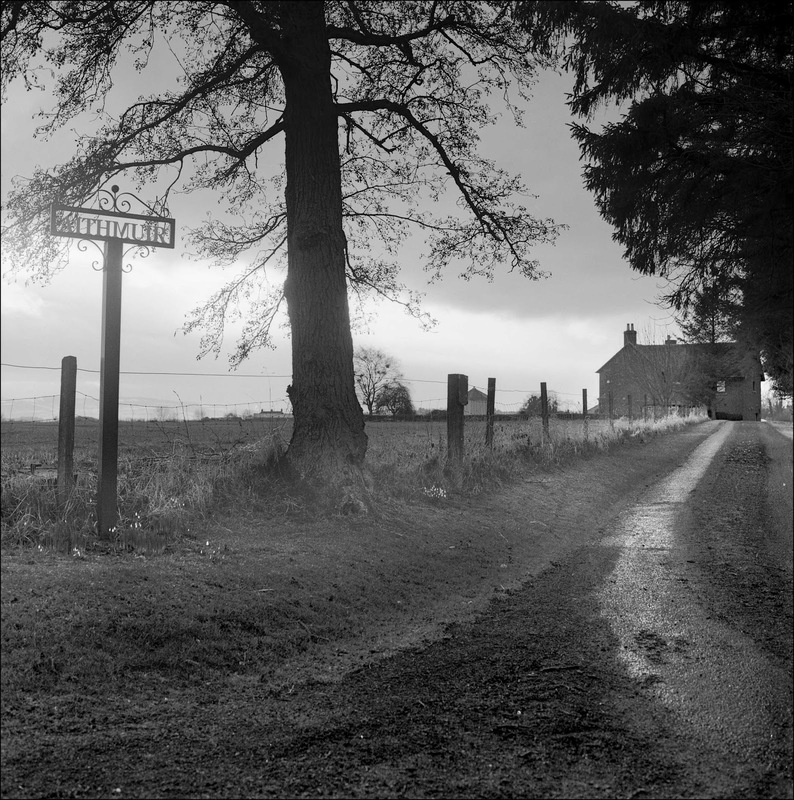 Love your photographs, particularly Aithmuir Farm. I guess some selective multi-grade printing would partially correct the softness of the flare, but I quite like this 'imperfection'. Thinking also of James Ravilious, I have a substantial stock (around 150 rolls) of 35mm Kodak Technical Pan (frozen from new) and the Technidol developer to go with this and it seems very unlikely I will ever get to use film again - I've got through 1,000 rolls of this extraordinary film in my time. If anyone is interested then I'd be pleased to negotiate. Tried to contact you through LinkedIn but not sure if you got my message or not. It was just to say that Icelandic photographer, Rax, is/was a heavy Technical Pan user. He's very approachable through his website and might love to hear from you.